What a full day! Art class for the boys, then to the Botanical Center for the free admission. I admit, with my boys (ok, and me), we can't make it past an hour there. I love botany, but if I can't eat it, it's not as fun. We then went to the free organic food tastings at our local Hyvee. Oh how we love you, Fleur Hyvee. We visit you often, and you bless us with 10 percent off every Wednesday. Then it was off for some more free stuff at a local (vegetarian) coffee shop. Oldest was with me for that one, as youngest got tired of not being home (my little home body). So, I dropped him off to hubby, as he finished deliveries with youngest in tow. 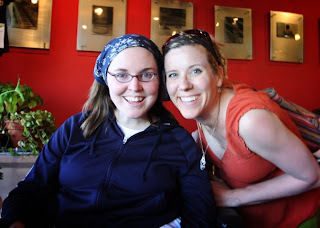 I met with a blogger friend at the coffee shop. How lovely she is. Pictures will be following shortly. (But have that baby first, Sar!) Funny note: there was a big sign that said Vegetarian, as we walked in the door. Oldest stated that he eats meat and likes it. I wonder if he realizes that I don't cook meat. LOL. I buy a chunk of ham for sandwiches on occasion--maybe that's what he means? We were then off to church, where there is--count it--2 more classes this spring. I love my 3-5 yr olds, but after 8-9 mo., I need a break. Learned of a dear friend who is moving. While I am sad, I know this has been her desire for a long time. Good for you, girl. I will visit--you can't stop me. We are a traveling family. Oh, the camping trip this weekend was cancelled due to cub scout sign up being low. We will camp as a family, soon, though. I'll keep you updated on that. Looking forward to 80 degrees and park day tomorrow. Iowa is not looking so bad, when it's warm. Another not fun to do on my list: go to DHS. No, I'm not in trouble ;) It was suggested by my multi-faceted muscular dystrophy clinic that I try to get some help to fix my van. If you know me well, you know that my boys (all three) have been muscling (is that a word?) my ramp door open for some time now. Slowly parts fall off of this wonderful van, but it will serve us well for many more years. Another one would be $30,000+. Gulp. Well, I'm up way late, but I've had wheat grass juice, so I'm very chipper. Pray I can get SOME sleep tonight! I'm so glad you will be coming to visit!!! I am very much looking forward to it! We are going to try to get a house with 4 bedrooms so we can always have a guest room. I can't wait!!! !